What Happens When You Write? If you want to be a writer, I'm assuming you feel you have something to say and a strong desire to say it. You may not know how you're going to say it or in what form (poetry, novel, essay, etc.) but you know something is there. Okay, you pick up your pencil or pen or you sit down to your computer or typewriter. Write something. Whatever you write, just make sure your heart is in it. It doesn't have to be perfect, it doesn't have to be neat. It does have to be expressive. Next, as painful as it may be, you have to show this writing to someone. It can be a friend, it can be a family member. Then, pay attention to what happens. Did the person reading your work cry, laugh or get angry? If so, you did that! It means you can have an effect with your writing. It's worth something. You have to keep going! If you're having trouble thinking about what it is you have to say, it may help you to spend some time each day in silence. Some writers pray. Some meditate. The idea is to get used to clearing your brain space and tuning in to your inner voice. You'll also be more aware of those little scraps of possibility floating around in your head that can later grow into big ideas. What Do You Want to Write? Experiment! It's okay if you don't know what you want to write about. It may take a long time journaling for you to see what keeps coming up for you. And it may take longer to find the form that fits you best. I went from poetry to essays to long-form letter writing before I settled on fiction. It took me years to do that. It doesn't mean I won't do anything else in those genres, but what I'm doing right now just fits. I encourage you to experiment until you find the form that suits your writing best. 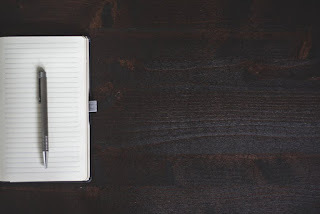 As you develop your belief that you're a writer, it's helpful to set up reminders that will jog you back to that brain space that you need to be in to write. When you sit down to write it's easy to get distracted and starting thinking about doing laundry or what's for dinner. You'll want to have something either on your desk or on the wall in front of you that reminds you to get back to work and that you are a writer. It might be your list of values that remind you that writing is a part of who you are. It may be simple words such as CREATE or INSPIRE. Isabel Allende, who writes beautiful, historical novels will sit in her office with photos around her, old photos of people who essentially represent her characters so she surrounded by them. That puts her back into the brain space of her book because she is sitting in their world; these people are all around her. What world do you need to be in? The journey you take to get there will be one of many you'll take as a writer. I hope these ideas will help you take those first steps. What you write--and where you go from here--is entirely up to you. Bon Voyage.